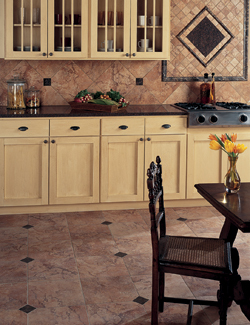 Do you plan to install ceramic tile in one room or throughout all of your living spaces? From kitchens and bathrooms to living rooms and bedrooms, ceramic tile can go anywhere – even on porches or patios. There are so many ways to use ceramic in your home. Visit our showroom to find out how. Because ceramic comes in many colors and designs, you can get the perfect color to match your home’s interior. Versatile, durable, and eye-catching, porcelain tile provide unmistakable charm when installed in a home or business. The ideal choice for many property owners, it is not only strong but remarkably elegant. It dramatically improves the ambiance of a room. Also, it is available in many styles and colors, as well as sizes and shapes. Best of all, at our flooring showroom, we promise low prices for our products. That’s something you will probably not find at other home improvement stores. Let us help you select the perfect porcelain tile floor for your upcoming renovation project. Porcelain tile is excellent for both casual and formal settings. At the same time, you can create endless designs throughout your home with perfectly matched decorative accents and trim pieces. Slate is a stunning and natural material that has been used for hundreds of years. A fine-grained rock, it is prized for its beauty and strength. Even so, the benefits of slate go far beyond the way it looks. Slate tile is also resistant to water, incredibly strong, and long-lasting. This makes it a perfect flooring material for bathrooms, kitchens, patios, and any other places in the home. It's also perfect for countertops, backsplashes, and showers, as well as areas that are prone to spills and moisture. Make a wise choice by choosing slate for your next flooring project. Do you want to save money? You may not know it, but slate is also an economical flooring option as well. Your new slate floor last for decades with only minimal care and maintenance. This saves you money. In addition, a slate floor is a major selling point if you ever plan to sell your home in the future. There’s no shortage of premium flooring at our store, because we have hundreds of in-stock options. Stop by our flooring center to find the perfect floor. Then schedule tile flooring installation with our team. We give you complete control and confidence in hiring an installer, because we have a preferred professional ready to serve you. Best of all, there are no hidden charges when you use our team. Our seasoned craftsmen have many years of experience in installing flooring. They work quickly so you can use your new floors right away. Get creative with your floors! We also create brick floor patterns, checkboard patterns, and tile borders to give your floors personality. Even though we take the time to help you choose your floors, prepare the surface for installation, and install your product correctly, we also offer special guarantees. For instance, if you purchase a 4-Star or 5-Star floor and you are dissatisfied with it after 30 days, we replace it with a comparable floor free of charge. With our Ultimate Confidence Guarantee, we ensure the quality of our products and services, as well as your complete satisfaction.